Assuming the role of Uncle Fester, the player finds himself/herself on a quest to save the Addams' town from the threat of space aliens. 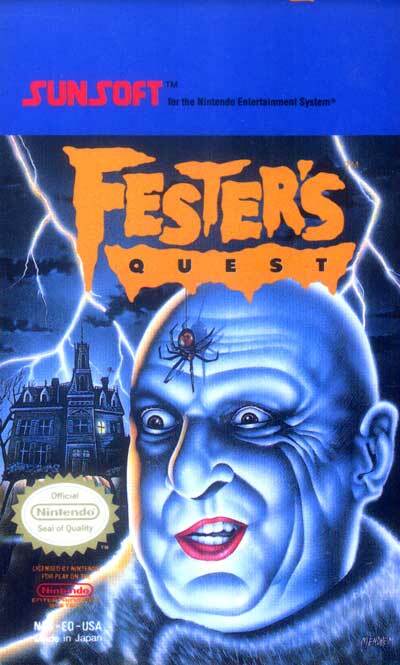 Fester is armed with a weak gun at first, but various power-ups are gradually gained in an effort to strengthen the gun; further along in the game, a whip may also be found and used to ward off enemies, which often take the form of weak space aliens. Along the way, Fester will encounter such Addams Family characters as Thing, Wednesday Addams, and Pugsley Addams, all of whom assist in supplying him with various forms of weaponry (bombs, whips, etc.). Gomez isn't seen in this game until the ending, but is mentioned in the manual as the one who must keep the house safe. In addition, Fester may secure money in order to purchase hot dogs, which replenish his life meter. The object is to rescue the townspeople from aliens, the strongest of which guard each area.